Yandex.Weather does not store weather history, but you can find out what the temperature was yesterday. The temperature in the shade the day before is displayed in the This time yesterday line. 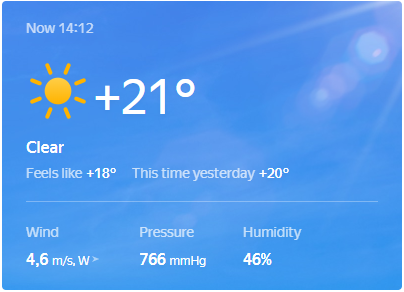 You can find it in the weather card on the Yandex.Weather homepage. The temperature is determined using the Meteum technology. It takes into account data from the nearest weather stations.